Special Reserve Editon. Hardcover. Octavo. 184pp. 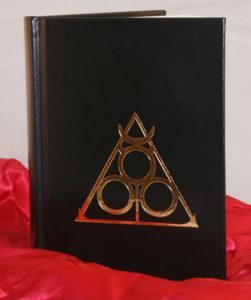 Bound in full black leather with gilt lettering to spine and gilt sigil on upper board. Smyth sewn, black endpapers, ribbon marker. Printed in red and black, b&w sigils throughout. This Special Reserve Edition was limited to 77 numbered copies that each have hand drawn sigils inside of them that can only be viewed under UV light. "The Book of Azazel is a striking example of a post-modern grimoire. It is my hope that elements of this book will serve as a model for other contemporary works of magic, particularly the willingness to experiment and attempt something that has never been done within occult publishing. The use of invisible ink is truly a wonderful idea. It continues a long tradition of hiding knowledge in plain sight. In the past, secret knowledge was protected via intentional blinds or coded within symbolic imagery. Today we have invisible ink to hide it from the eyes of the profane. I hope this book inspires other writers and publishers to push boundaries and experiment with what the 21st century has to offer."